We provide turn-key industrial moving power systems! Ergonomic Partners can solve your conductor bar electrification problems on your new or existing overhead bridge cranes, gantries, jibs, and monorail hoists. Whether you have 8-Bar, V-Bar, Insul-8, or an obsolete brand of electrification on your existing crane or hoist we can retro-fit your old system with a new festoon cable system or conductor bar system. For new cranes or industrial moving power applications we recommend c-track festoon or finger-safe enclosed conductor bar. Our sales engineers can quote turn-key, reliable, high-capacity bar, rail or I-beam electric systems needed by factories, mills, storage yards, people movers, and other rigorous applications. 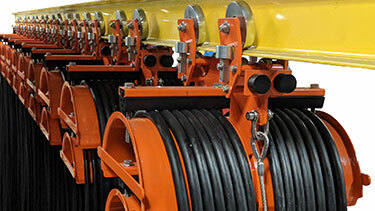 C-Track, Square Track or C-Rail cable festoon systems are versatile and used in a variety of different applications; for power delivery and cable management in industrial applications such as overhead (EOT) cranes, port container cranes, process cranes, hoist units, transport systems, water treatment systems, car wash systems, bulk material conveyors, plating lines, and many other types of moving equipment. We furnish pre-assembled and wired festoon systems complete with control box trolleys, pendant stations and plug and play hardware. Ergonomic Partners can reduce your labor expense associated with field wiring by ordering a pre-assembled plug and play festoon system with a matching complete control panel. Indoor/Outdoor festoon in flat cable or round cable and air hoses. Sizes in 4, 8, 12, 16 or 24 conductor from 000 AWG to 16 AWG. Conductors are annealed copper, each conductor has color coded jacket, resistant to UV, ozone, water, oil and weather. Jacket rating -40° C (-40° F) to 105° C (221° F). 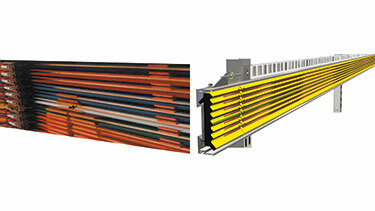 C-Track 12 or 14 Gauge available in galvanized or stainless steel. Factory pre-formed curves in 14 gauge systems are available in 4, 5, 6, and 7 feet radii. Custom curves can be bent to a minimum of 40 inches. Heavy-Duty Aluminum, Aluma-Track, formed to a minimum of a 36 inch radius, Single and double flat and round cable trolley saddles available; trolleys are equipped with ball bearing wheels capable of traveling at speeds of 250 fpm., supports 150 lbs. of cable. With a staff of over 9 technicians, 7 fabricators, and 4 engineers we can design, build, configure, and install turnkey festoon systems. Our parts support staff provides: Individual components, Plug and play festoon hardware, Pre-assembled festoon systems, Festoon parts, Service, Sales, Repair and Installation. 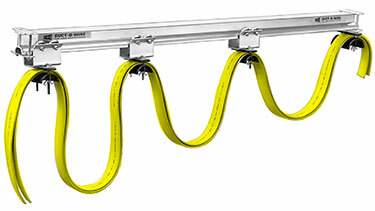 Figure "8" conductor bar is the original material handling industry standard for crane runways, trolleys, conveyors, automatic stacker-retrieval, and the economical moving power system. We offer a wide variety of mobile electrification crane conductor bars from Magnetek (Electrobar), Duct-O-Wire (Duct O Bar), and Conductix (Insul-8). We have utilized this electrification on overhead cranes, gantries, runways, hoist monorails and any mobile product that needs power. Whether you refer to it as buss bar, bus bar, conductor bar, enclosed conductor bar, figure 8 bar or mobile electrification we can help with your material handling project. Side and Bottom contact Figure 8 conductors from 90 to 350 AMP. Heavy duty conductors in 500, 1000, and 1500 AMP ratings with stainless steel running surface for longer wear and higher speed operation. Factory built expansion sections and anchors for expansion control. 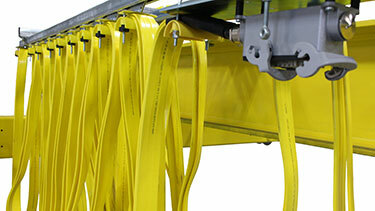 Epoxy coated, stainless steel, and insulated hangers for wet and corrosive atmospheres. Factory bent curved conductor sections for Figure 8 systems. Minimum bend radius is 30 inches. 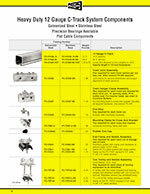 Heated conductor systems for ice prevention on outdoor systems or freezer storage. 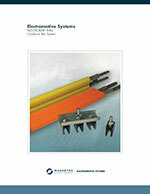 Bare conductors available for extreme heat applications. A variety of Figure 8 covers totally enclosed covers with flap for air-born contaminants, for indoor & outdoor high temperature cover (280° F) with ultra violet additive for direct sunlight outdoor locations. Special cleaning long-wear collector shoe brushes for Figure 8 systems. 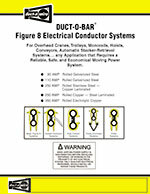 The Safe-Lec 2 conductor bar is a positive tracking, v-type collector shoe contact electrical bar system. It is the new standard in overhead crane electrification; the SL 2 is ideal for monorails and just about any material handling system electrification application. 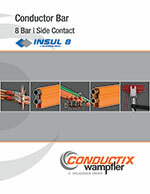 Conductix-Wampfler Hevi-Bar II conductor bar system is designed for reliable power delivery in high-capacity crane rail electric service needed by factories, mills, storage yards, people movers, and other rigorous applications. Current Ratings: 500 amps, 700 amps, 1000 amps, and 1500 amps, at 600 volts. Maximum speed ratings of 22 mph | 2,000 feet/minute (609.6 meters/minute). 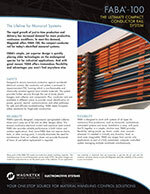 Low Maintenance and Long Life - this is truly an "install it once and forget about it" conductor bar system! Electrobar Elite is a totally enclosed 4 conductor, bar system; available in 60, 100, 130 and 200 AMP configurations, IP23 finger safe rating, with a lightweight, rigid design. 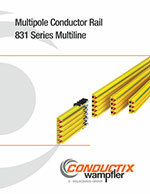 Modular construction and other design features significantly reduce installation time and cost as compared to other conventional conductor bar systems. This is ideal for hoist monorails. Easy installation and maintenance. A unique shape that maximizes safety and performance. UL Listed "finger safe" design that minimizes the potential for electrical contact. Available in 90, 110, (125 non-UL applications), 250 and 400 AMP ratings, and single and double shoe collector assemblies. 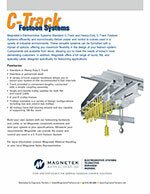 Snap-in hanger kits are available for 2, 3 and 4 pole applications. We offer a variety of electrical flat and round cable configurations to meet the demands of nearly every application requirement. Our festoon systems by Magnetek and Conductix-Wampfler are employed worldwide in steel mills, ports, zinc coating shops and compost preparation facilities. Systems have a modular design to ensure an above-average operational life and are available with galvanized finish or stainless steel for the roughest of environments. In addition we offer Marine Terminal I-Beam Systems designed for heavy-duty applications operating in harsh environments with 230, 380, 460, 575, and 690 volt, 3-phase, 60 Hz. 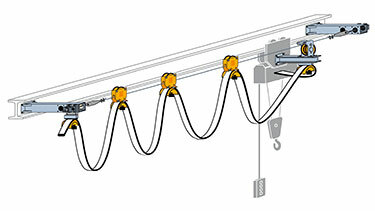 Whatever your requirements, Ergonomic Partners can provide the power and control you need in an I-Beam Festoon System. Available for indoor/outdoor environments. Wire supported (tagline) festoon systems are ideal for light duty 1/4-ton to 5-ton jib cranes, gantry cranes, and monorails. 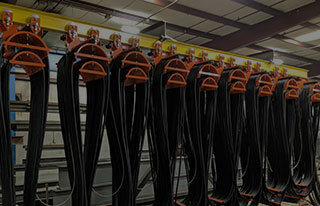 Wire rope systems are available for flat and round cables, or air hoses. Our basic wire rope tagline kits: Includes two trolley stops with tagline angles, tagline cable (wire rope), 2 cable clamps, 2 eye bolts and 5 "S" hooks. 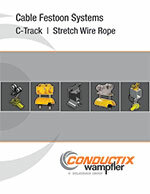 Electrical wire and wire rope trolleys are not included. 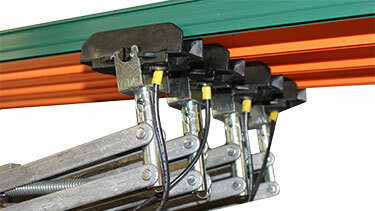 The kit also includes two trolley stops with mounting hardware. For fully automated and autonomous electrified monorail systems (AEM), multiple simultaneous workloads, or continuous flow production we recommend our FABA 100, EcoClickLine, and MultiLine 0831 systems. The small, compact multi-conductor rails are designed for providing power up, down, under, over, around- and wherever it's needed in virtually any direction, level, or work area imaginable. Ergonomic Partners provides conductor bar and festoon cable systems; serving clients from coast to coast, Canada, Mexico and especially focused in the states of Missouri, Illinois, Indiana, Kansas, Arkansas, Mississippi, Nebraska, Tennessee, Kentucky, Iowa, and Oklahoma.